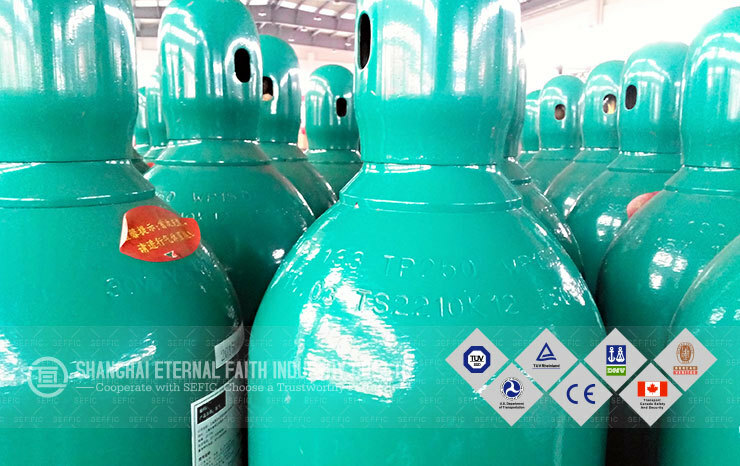 The nitrous oxide gas cylinder are all made by high quality seamless steel pipe,consistent height, smoothly painting, and excellent properties, which is widely used for steel cutting, welding, electronic, medical and other fields. Packing 1.bulk loading; 2.packed in plastic woven net; 3.packed in wooden pallets; 4.as required. 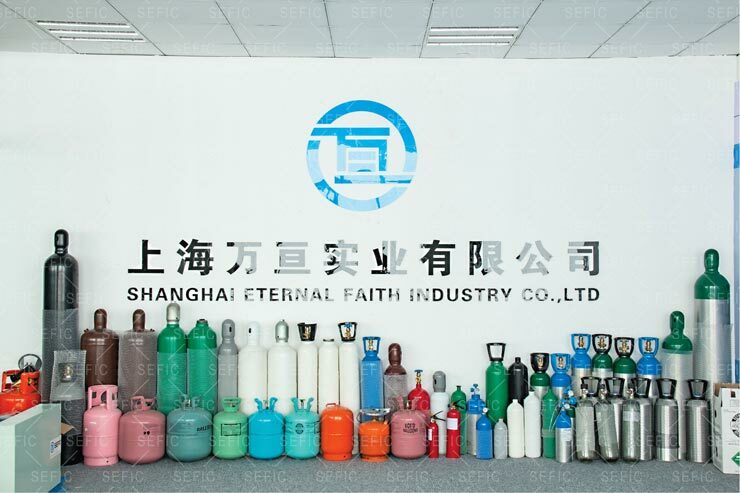 About SEFIC As a China gas cylinder manufacturer, SEFIC offers Oxygen Gas Cylinder, Nitrogen Gas Cylinder, Argon Gas Cylinder, CO2 Gas Cylinder, Hydrogen Gas Cylinder, Helium Gas Cylinder, Acetylene gas cylinder, CO2 Cartridge and Aluminum Cylinder … CE/TUV certified. SEFIC introduces advanced equipment, technical standards and quality management system and carries out strict production operation and quality inspection actively so that each team has accurate task and clear responsibility. We also have implemented strict complete quality and security control system, which ensures that each gas cylinder can meet the quality and security requirement of our customers. There is a saying: "one can’t make bricks without straw." We believe that material quality is a prerequisite for high-quality gas cylinder, so SEFIC adopts strict control on raw materials procurement procedures and implementation of occasional sampling system. Most of our raw materials come from the cylinder Shougang group shougang qian'an iron & steel company, and we have quality certificate of each batch of materials. There are detailed and long-term records and reports of work stress, internal stress, strength, ductility, hardness, toughness and other mechanical properties and machinability properties, malleability, castability, weldability and thermal expansion, magnetic, electrical and other physical and technological properties of raw material. Heat shrinkage bottom and bottle mouth directly affects the qualified rate of the late cylinder, cylinder operator need to carefully fill in the bottle wall thickness, and the appearance, manufacturing tolerance and original records, such as data and bottom anatomy test report single, closing and collected at the end of the monitoring records to facilitate later product quality tracking. First preheating, the test ring above the specimen captured test, then the cylinder body is put into the thermal aging furnace heat treatment, to gradually eliminate the stress of steel cylinder body, cylinder visual inspection after the heat treatment of the cylinder, scrapped the deformation, cracking and brittle fracture of the cylinder. SEFIC engineers believe that heat treatment is the most important to eliminate internal stress, but only by heat treatment to eliminate internal stress is not enough, to the extent to reduce the use of hidden dangers in the latter part of the cylinder after the heat treatment, the cylinder in the factory to use 15-20 days, to use natural aging to eliminate residual stress. In the late use of gas cylinder, gas contains trace oil, gas bottle valve or cylinder after the use of non - off valve side of the bottle, so that the acid, alkali, combustible or other impurities fall into the bottle, will lead to the corrosion of gas cylinder, so that the body of the cylinder is very important to clean and dry. Mechanical gas cylinder, hardness, and the degree of linear correlation detection and tensile test, impact test and flattening test, the unqualified gas cylinders do recording, isolation, processing, such as the case of batch unqualified cylinders, cause analysis is carried out to find the problem, and timely credited to the steel bottle archives. We change gas cylinder hydraulic pressure measured method in bottle test conditions, and the computer control technology, overcome the pressure gas cylinder closed beta test were affected by the experimental conditions affecting the shortcomings of, so as to improve the measurement accuracy, to fit the conditions of mass production. Completed after water pressure test cylinders must immediately remove the internal cylinder of water drained, through the cylinder internal dry device for drying operation, to avoid the cylinder internal rusting and impact on the quality of the products, thus affecting subsequent inspection. So the cylinder drying is an important part of the process of production and inspection. Will fill the tank with the provisions of the pressure gas tank, so that any part of the cylinder from the surface minimum depth greater than 5cm, to check the gas tightness, through the mechanical slowly rotating cylinders, observe the wall of the bottle is no bubble, such as found in the gas bubble or bubble, then need to sort out. The gas cylinder seal has two parts: gas cylinder manufacture seal and gas cylinder inspection stamp. Making seal includes gas filling name, serial numbers of the cylinders, experimental pressure, working pressure, the weight of the cylinders, cylinder volume, the bottle design wall thickness, production time, etc. ; the inspection stamp including unit test code and test date. Shot blasting is not only in order to remove the surface oxide skin and sand casting, and also to check the quality of the casting before an indispensable preparation procedure, shot blasting can also increase the dislocation structure, to improve the strength and fatigue strength of cylinder body has a important significance, and the spray paint technology to prepare. Paint can in the cylinder surface to form protective film, can prevent or delay of cylinders by prolonged exposure under the water, microorganism erosion caused by metal corrosion, can also use color to mark the bottle of gas, for electrical insulation, anti fouling, anti resistance, heat insulation, radiation resistance, conductive, magnetic etc. also has a certain role. 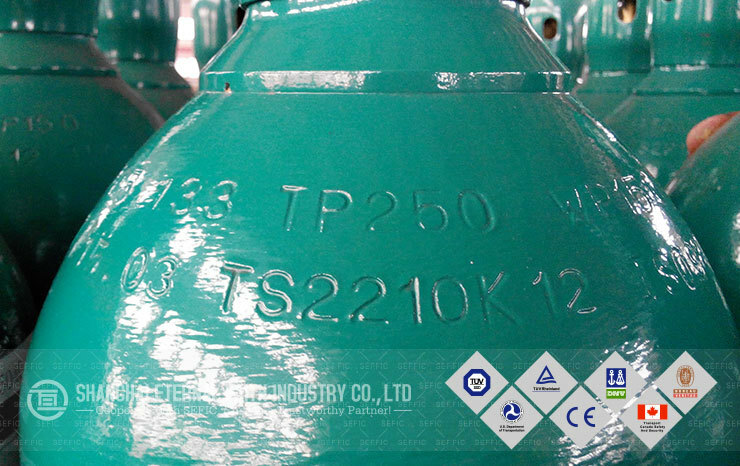 Every batch of gas cylinders (200 pieces as one batch normally) are manufactured and tested under supervision of local special equipment inspection and research institute and then issued batch test report.Of course,each finished gas cylinder before delivery to customers has to pass leakage test to ensure no leakage occurs. According to customer requirements, SEFIC to spray the surface of the printing cylinder customers need to text, it can play the difference between a logo and brand promotion of the role of complete, customers can design their own spraying the contents of the cylinder surface, of course, SEFIC also be free for you design. Random sampling is an important part of quality control cylinders, inspector through observation, measurement, test and judge, a conformity assessment carried out on the upcoming cylinders manufactured, and quality inspection of product quality inspection agency can invite to plant for testing, or after the invitation to the customs inspection agency to customs to detect. The gas cylinder usually packed by pallets, wrapped by pvc, also can use the bulk loading , if you have other requirement of the package of the gas cylinder, we also can do it as your required! 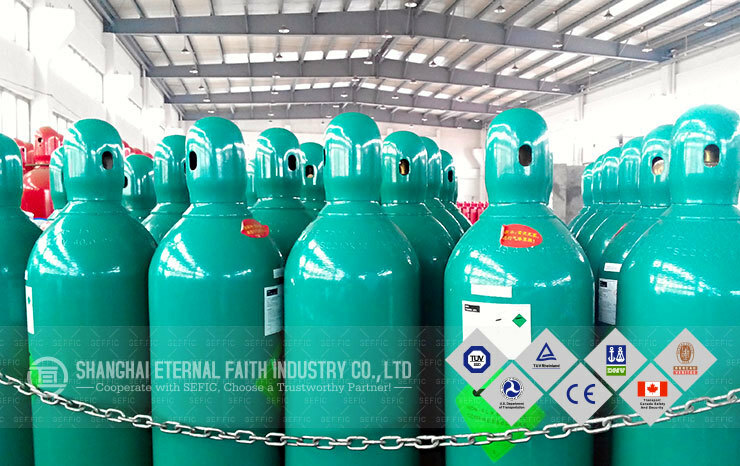 We are always packaging the gas cylinders carefully, and we will be responsible for each gas cylinder, you can rest assured to cooperate with us! SEFIC is an integrated company which designs, manufactures, sales and services in the pressure vessel field, We have CE, TPED, TUV, etc. 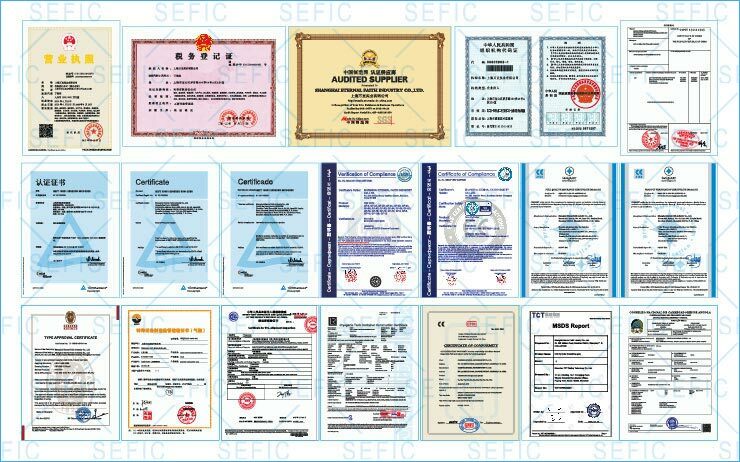 on the pressure cylinder production and sales certificate, can be directly through the freight forwarding customs procedures, so far, sefic had serviced more than 60 countries clients. Usually SEFIC contact forwarder to pull the container to the SEFIC plant, and then carry out the cylinder loading. If the gas cylinders packed by pallet, it’s easy to load them into the container and unload them from the container. If you need to bulk, we can also do it, but we don't normally recommend doing so, this may in the transport process may damage to the cylinder of paint. Q:What is the capacity of the gas cylinder you can provide? A: 40L argon cylinder is the bestseller, we can offer 2L- 80L cylinders as your required. Q: What is the delivery time of the gas cylinders in sefic? A: 25 Days once deposit received and workshop drawings confirmed about the cylinder. Q:What certificates do you provide for gas cylinders? A:We are authorised by ISO/GB/TPED standards. Q: Can you detail about the gas cylinders, packing and shipping? Q:Do you have any protection for the head of the cylinder? the safety of the gas cylinder during the transportation. Q: Why SEFIC is more worthy of our choice? A:1. Original Manufacturer: SEFIC has professional equipments for gas cylinders. 2. Large Output capability: SEFIC has the capability to produce more than 50,000pcs of Gas Cylinders per month. 3. Series: SEFIC has different series and models for different standards. 4. Exporting experience: We have 30 years' experience for exporting business. Q: Do you have any special attention about the gas cylinder? 1. The High Pressure Gas Cylinders should be stored in dry cool place, away from heat. And fireworks prohibited when use it. High Pressure Gas Cylinders shall not fall, impact and need to avoid exposure during transportation. 2. Pay attention to safety use because the gas cylinder is flammable and explosive. Located in Shanghai, SEFIC is a professional supplier of gas and gas equipment. 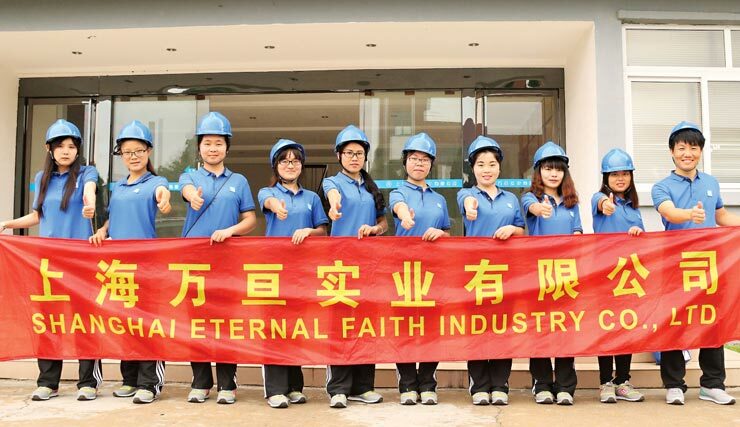 Founded in the 90s, the company has already accumulated enough experience and became one of the best suppliers of all kinds of gas and gas equipment. Besides, it is one of the earliest in the country to gain the License of Pressure Vessel Type A2 and C2, ISO9001 and ISO14000 Certification, Private Hi-Tech Enterprise, Hi-Tech Enterprise, and Special Equipment Manufacture Permission. 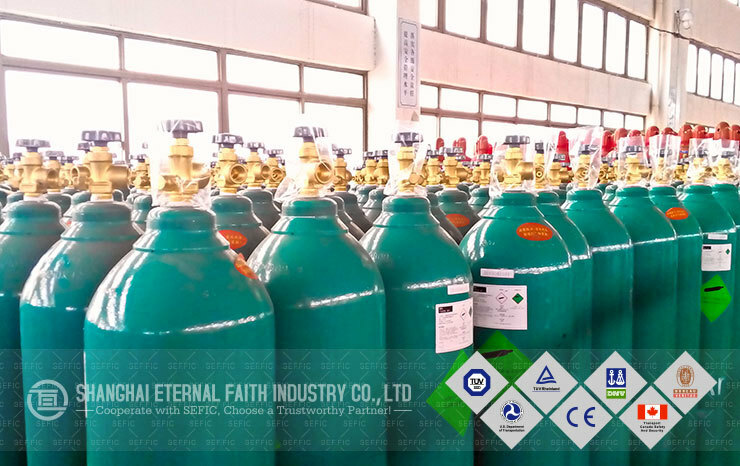 We almost can supply all kinds of gas cylinders with TUV, TPED, CE and DOT certification. We have more than 30 years experience in gas equipment industry and have gained a sound reputation all over the world. Our products have served customer satisfaction from more than 50 countries all over the world. So far, our business has expanded globally to countries and regions such as the US, EU (mainly Germany, Portugal, Romania and Bulgaria), South America (mainly Chile, Peru and Bolivia), and Africa (mainly Angola and South Africa). We also put the common steel cylinder samples in our headquarters office for the convenience of customers to view samples and know more product information of SEFIC. If you need the relevant product information of steel cylinders or aluminum cylinders, catalogues and samples are provided; Any call or emails are welcomed, or you can also visit SEFIC official website: www.sefic.com.cn or leave messages on the product page, SEFIC will be happy to serve you! SEFIC has rich experience in business operating and management, and own capability of processing various gas cylinders.SEFIC have adopted certifications of ISO by International Standardization Organization, DOT of America, TC of Canada, TUV of Germany, KGS of Korea and some other certifications. Adhering to the Corporate Philosophy of “ regard quality as credit, credit as brand and brand as life”, and “Repeat simple things, do repeated things with heart, quality goods comes out of concentration”. With safe and dependable products and quality service, SEFIC has established good corporate image and won recognition and praise of the industry. In the year 2005, we strove to realize transformation and global market expansion by growing from a gas equipment manufacturer into a gas project solution supplier and set up overseas marketing teams in our headquarters.By providing gas equipment and technology support to several establishments of new ,plant, we thrived the growth of the company. 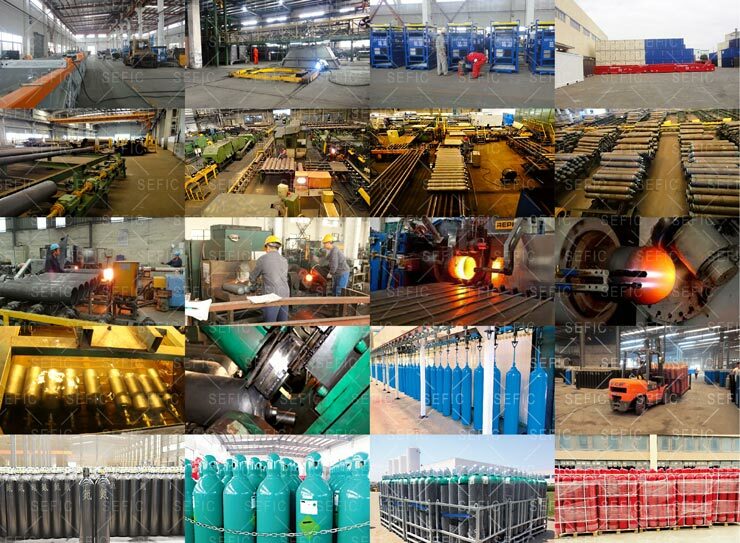 SEFIC has implemented a strict and complete quality control system, which ensures that each gas cylinder can meet quality requirements of customers, and all cylinders have been strictly inspected before shipment. SEFIC always supply the lower price! We never stop trying to find new ways to reduce the gas cylinder cost, so that we can offer our customers a competitive price. Cooperate with SEFIC, Choose a Trustworthy Partner! We are committed to work hard to ensure that every shipment of the gas cylinders are safe, punctual arrival, we have a lot of partners which always provide the most rapid means of transportation. SEFIC has different series and models, for different standards in different countries, and we are committed to providing the best service. Cooperate with SEFIC, Choose a Trustworthy Partner! 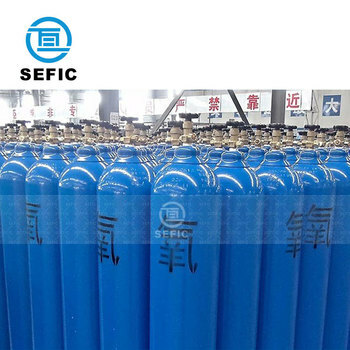 Cooperation with SEFIC to achieve the sales relationship from the manufactory to the customer, can improve the production and delivery efficiency of the gas cylinder. SEFIC has professional equipments for gas cylinders. We have the capability to produce more than 50, 000pcs of Gas Cylinders per month. SEFUC has implemented a strict and complete quality control system, which ensures that each gas cylinder can meet quality requirements of customers, and all cylinders have been strictly inspected before shipment. We accept OEM work, SEFIC can manufacture gas cylinder handle, gas cylinder cap, gas cylinder valve, gas cylinder Mark and gas cylinder color as your required.